Herbert Bayer was apprenticed to an architect in Linz, Germany, in 1919 and worked as a graphic designer for the architect Emanuel Margold. Between 1921 and 1923 he attended the Bauhaus where in 1925 he was appointed to teach typography and graphic design. On leaving the Bauhaus in 1928 he moved to Berlin where he practised as a graphic designer for the next ten years as director of the Dorland Studio. It was during this period in Berlin that he took up photography independently from his incorporation of it in graphics. His photographs of geometric solids became the starting point for other artists’ application in advertising; for example, McKnight-Kauffer, who was then working for the Anglo–German company Crawford’s. Bayer never followed László Moholy-Nagy’s visions for more complex artistic experiments such as typography, preferring instead to take a fairly pragmatic view of communication in advertising. However, like his colleague, he enjoyed taking photographs from improbable viewpoints – in particular, shots from high vantage points, such as the Transport Bridge in Marseilles that Moholy-Nagy also photographed regularly, capturing the grids of the bridge structure in his compositions. In 1938 he moved to New York where he designed the exhibition ‘Bauhaus 1919–1928’ for the Museum of Modern Art. 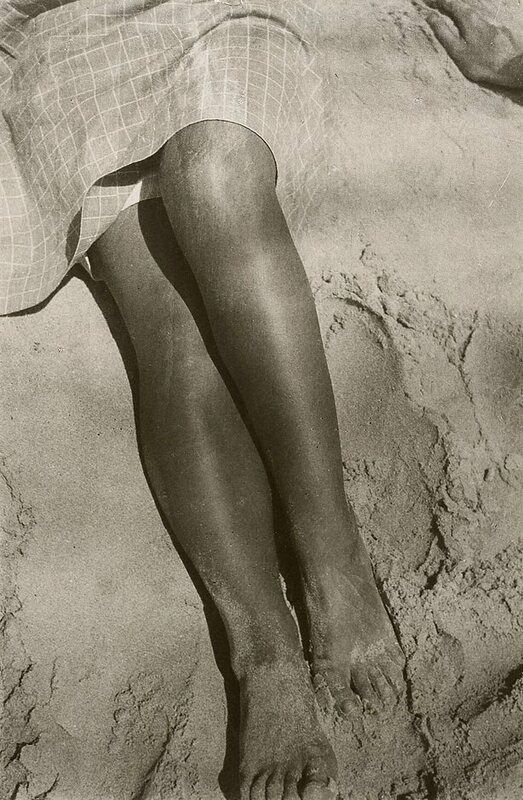 ‘Legs in sand’ is a good example of the high viewpoint; it also shows the Bauhaus tendency to get in close to the subject (for example, the tightly framed portraits of Grit Kallin-Fischer) and to show the body from unusual angles. The photograph was selected by Franz Roh and Jan Tschichold in 1929 for the important exhibition ‘Foto Auge’ in which works were very particularly juxtaposed, with Bayer opposite Brett Weston’s ‘Roofs of corrugated iron’ c1929. Signed and dated l.r. verso, pencil "Bayer 1928". Anthony Bond, Photography: Art Gallery of New South Wales Collection , 'International modernism', pg.93-111, Sydney, 2007, 108 (illus.). Renée Free, AGNSW Collections , 'The Western Heritage, Renaissance to Twentieth Century', pg. 108-172, Sydney, 1994, 154 (illus.). Unknown and Unknown, Film und Foto , Stuttgart, 1979, 120 (illus. ).